In this hustling and bustling world where people are connected through social media even when we are physically alone, finding complete solitude can be a luxury. One may think of it, but mostly find it a far-fetched dream. For those who’ve ever dreamed of removing themselves from their overloaded routines, tvN’s new reality show “Solitary Stay” is a decent alternative. 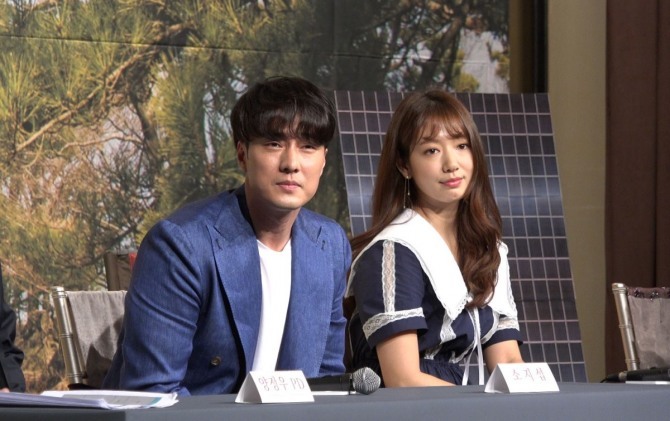 Featuring two big-name actors So Ji-sub and Park Shin-hye, the documentary-formatted program follows their off-grid lives in a house in the middle of the woods, out of the reach of people, technology and their showbiz lives. The name of the two stars may sound appealing enough. But program director Na Young-suk warned that it may not be everyone‘s cup of tea. “I should warn people though. ‘Solitary Stay’ can be quite boring. 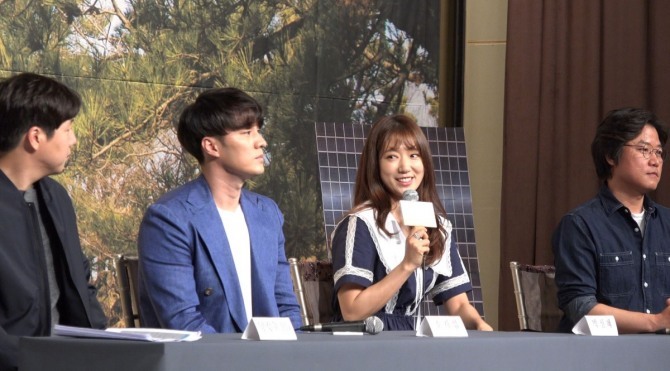 We as staff were also doubtful about the show’s viewership, thinking, ‘Who would watch a show that only features two people living in solitude?’” said Na during a press conference for “Solitary Stay” in Seoul on Wednesday, attended by So, Park and Yang Jung-woo, co-producer of the program along with Na. “Park saved the program, as we were about to give up on it if she didn’t accept it,” Na said. Na explained that the show’s goal was to offer a sense of vicarious satisfaction by featuring So and Park as subjects of an “experiment.” And during the casting process, Na came up with So and Park, the two people whom he thought wouldn’t have difficulty in fully immersing themselves in solitude, or even find happiness from it. Casting So was a bit complicated, as the actor had initially refused the idea. Making a regular appearance in a variety show for the first time in 18 years, So said he decided to join forces with Na as he deeply empathized with the program’s aim to heal viewers’ hearts. He also said that shooting the show -- living without technology with minimal necessities and spending time mostly alone -- didn’t veer much from his real life. Park said that she has actually enjoyed living in nature and learned how to focus on each moment. “In the past, I thought happiness was about doing something. But while shooting the show, I felt happiness when I was good at chopping firewood and picking up many pine cones. I’ve been a multi-tasker, but I loved the ‘doing only one thing’ rule, which was one of the missions on the show,” she said. 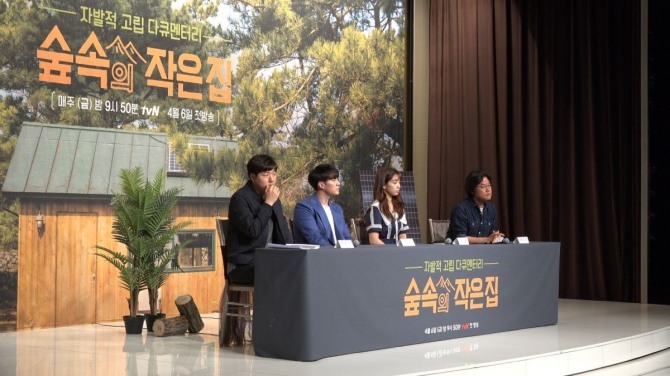 Na has seen huge success with popular variety shows such as “2 Days & 1 Night,” “Grandpas over Flowers,” “Three Meals a Day” and “Youn’s Kitchen.” But this time with “Solitary Stay,” he plans not to obsess over fun or viewership. Na repeatedly emphasized that the program may be lacking in humor. But he filled that blank space with the sound of water and wind instead. “I could have made the show more interesting, for example, by focusing on So and Park’s communication and making them live next door. But we didn’t, as the show’s intention was to show how the two adjust to complete solitude,” he said. “My company told me, ‘Do whatever you want for once. Don’t care about viewership.’ So yeah, I’m telling you, it can be a program that you might want to watch before going to sleep on a Friday night,” he jokingly added. The program will premiere at 9:50 p.m. on Friday.